Writer Lawrence Tabak speaking with Lake Effect's Joy Powers. When the State of Wisconsin announced a deal with the tech manufacturing company Foxconn, many Wisconsinites were first struck by the price tag. The initial announcement of $3 billion dollars in subsidies, was the largest subsidy in the state’s history. By some estimates that number has since risen to $4 billion dollars. But as the plans for the factory move forward, more residents have become concerned about some of the other aspects of this deal. Some are concerned about the plant’s intense water needs, others have raised issues with the types of jobs they will be providing. "It's actually a plot larger than the entire city of Racine, which has a population of about 77,000. So it's quite a large plot and naturally there are houses, residences, within that large area." The reason? The village needs to obtain the homes in order to make the land available for the factory. "It’s actually a plot larger than the entire city of Racine, which has a population of about 77,000. So it’s quite a large plot and naturally there are houses, residences, within that large area," says Lawrence Tabak, a freelance writer who wrote about the situation for Belt Magazine. When the state penned the deal with Foxconn, they had yet to acquire the land they promised to the Taiwanese-based tech company. In fall, notices were sent out to residents in the footprint of the Foxconn site, telling residents their homes were being marked as blighted, a necessary designation to exert eminent domain in Wisconsin. "It was a sad litany of homeowners stepping before the committee and demonstrating, without much equivocation, that their properties certainly didn't look blighted." In accordance with the law, there have been a number of hearings held by the Community Development Board of Mount Pleasant, which is still in the process of designating the area as blighted and hasn't officially sent out monetary offers to the residents. While the residents are guaranteed a "fair price" for the land, that sum is based on the pre-Foxconn evaluation of the property, and residents are saying the price doesn't cover actual replacement costs. Tabak attended one of these hearings and says it was "quite a spectacle." He explains, "It was a sad litany of homeowners stepping before the committee and demonstrating, without much equivocation, that their properties certainly didn't look blighted. A lot of them brought pictures and poster boards of their property, people talked about the years they've spent improving their property. It was quite an emotional and sad event." 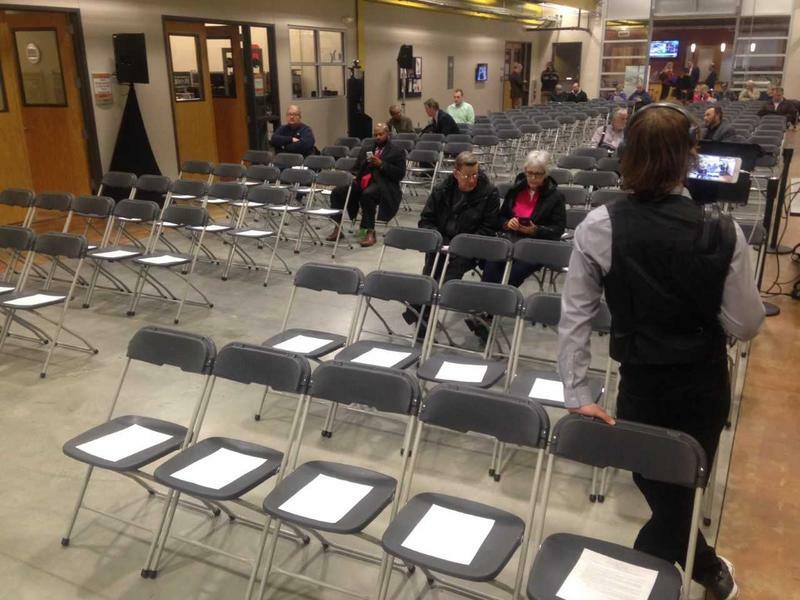 Some residents are mounting a legal challenge against the municipality, but it remains unclear what they will be asking for from the board. According to Tabak, a lawyer working for these residents was present at the hearing, and he made this clear: If the village of Mount Pleasant intends to fight this, "they will lose." About four weeks ago so many people crowded the SC Johnson iMet Center in Sturtevant, they had to be shuttled in from a nearby movie theater parking lot. The topic of that hearing was the City of Racine’s request to divert Lake Michigan water so that Foxconn can pump up to 7 million gallons a day to feed its water-intensive manufacturing system. While advocates of bringing Foxconn to Mount Pleasant stood behind delivering Lake Michigan water to the plant, people in the crowd at the public hearing Wednesday remained unconvinced. In order to get water to Foxconn, the Racine Water Utility hopes to pipe Lake Michigan water from the Great Lakes basin across Racine County, into the Mississippi River basin that eventually drains into the Gulf of Mexico. One of Gov. Walker’s erstwhile top lieutenants defended the Foxconn deal at a luncheon Tuesday in downtown Milwaukee. 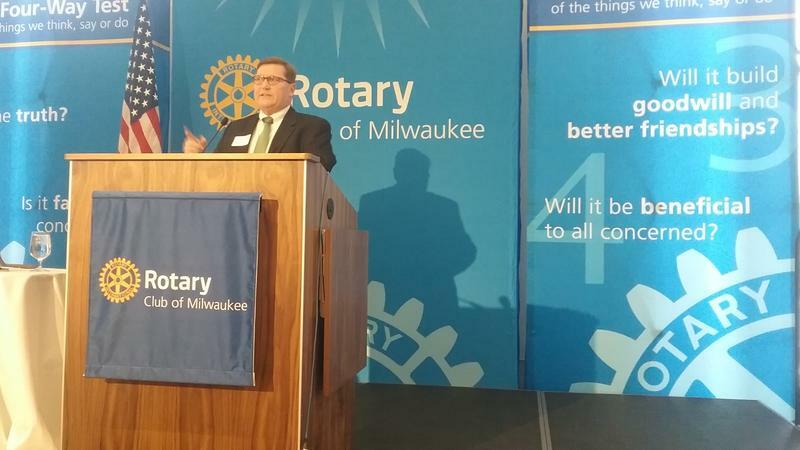 Former Department of Administration Secretary Scott Neitzel spoke to a couple hundred people at the Rotary Club. While Neitzel assured the crowd of the Foxconn promise, some were skeptical. Neitzel retired from the post last month, after helping to secure the agreement with Foxconn. He says he was honored to help the Taiwanese company build a huge LCD screen manufacturing plant in Racine County. Neitzel insists the deal will protect Wisconsin taxpayers. As Foxconn gets closer to breaking ground in Racine County, the next task is to determine how people who don’t live near the LCD screen plant might get to the campus. 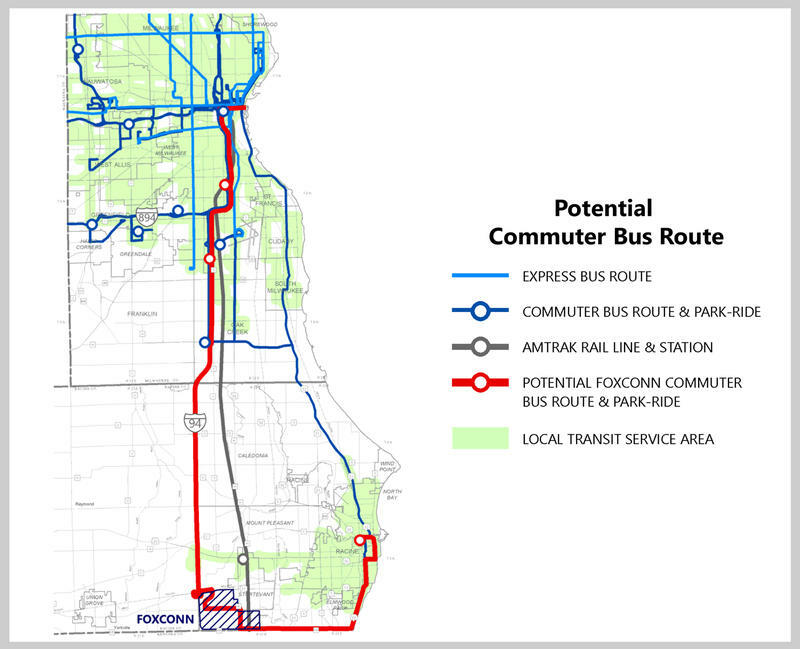 Representatives of the regional planning commission outlined potential options -- and costs -- at a public transportation review board meeting Wednesday in Milwaukee.